In April 1959, the Marxes began filming a pilot for a weekly TV series named Deputy Seraph. The premise was that Chico and Harpo were angels whose job was to possess people for brief periods to make things go the way they should, i.e. bring two lovers together, expose and foil a blackmailer and so on. 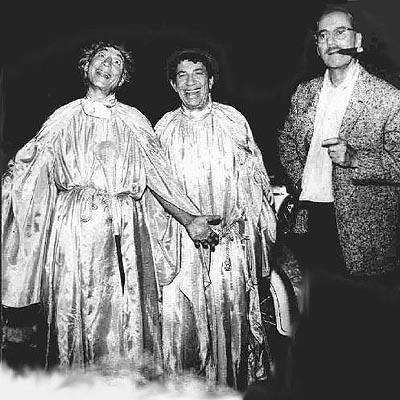 Groucho was cast as a Deputy Seraph who would appear in approximately every third show to help undo some of the pandemonium created by his brothers. It seemed to be a perfect concept. The Marxes were getting too old to do a regular series but in this way they would only have to film a fraction of each episode with other characters impersonating them for part of each show. The Marx scenes would be filmed in Hollywood while the other scenes would be filmed at Pinewood Studios in England. The pilot story involved a triangle between a young composer, the neice of a compulsive gambler/concert pianist and a sleezy casino owner. A psychiatrist attributes the pianist's strange habit of shooting the piano keys and speaking in an impossible Italian accent to variuos childhood traumas. An assortment of pseudo-Marxes appear at odd times and odd bodies. In the end, the girl and boy gets each other and the villain gets what he deserves. Unfortunately, the pilot was never completed as the project was canceled due to the fact that it was discovered that Chico was suffering from arteriosclerosis and could not, therefore, be insured. He would die in two years. All that remains of the pilot episode of Deputy Seraph is about 15 minutes of raw, unedited footage, usually beginning with "dead starts", i.e. the Marxes waiting for the cue to begin. It's presented at www.marx-brothers.org/whyaduck.